Hi All! Today I am going to share with you a new technique that I recently learned. 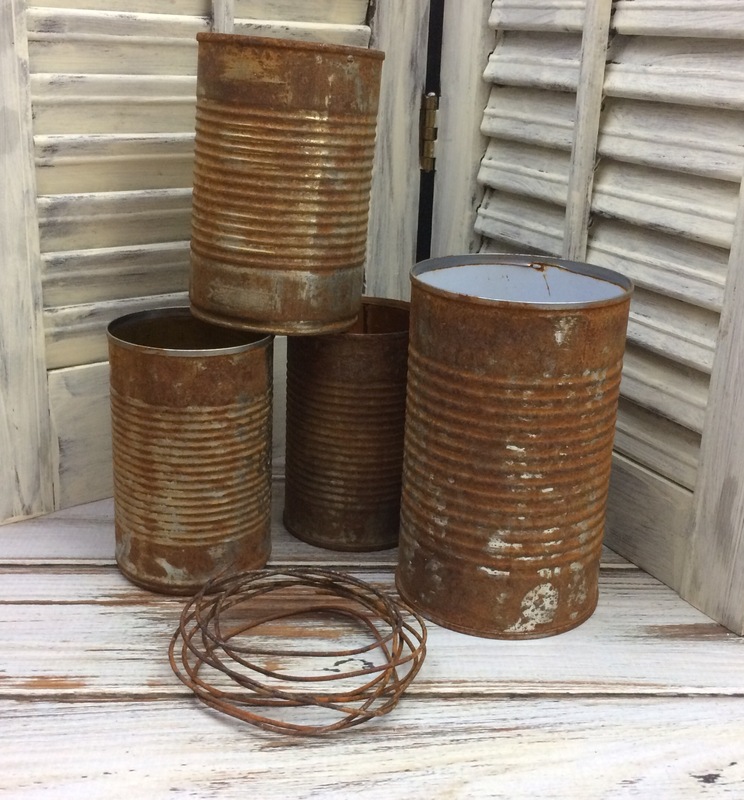 For the longest I have been wanting some rusty cans to craft with so I searched the web till I found a way to make my own rusty cans. Found this recipe at Lucy Designs and it works great. Depending on how rusty you want your can, how many times you have to repeat the process. 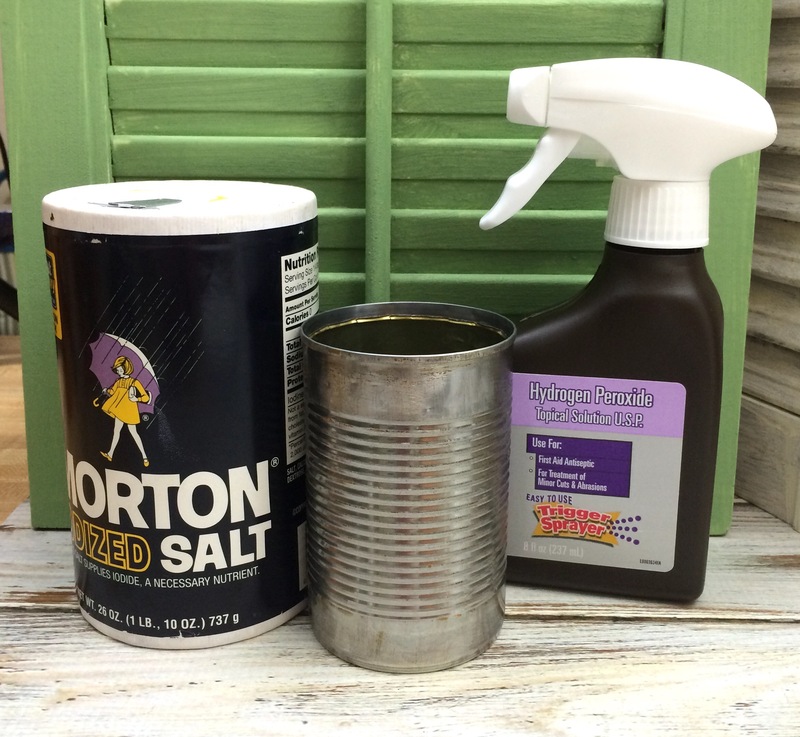 You will need a tin can, salt, and Hydrogen Peroxide to make your own rusty can. First scratch up the surface of your can with coarse sandpaper, then spray the can with Hydrogen Peroxide and sprinkle salt over the can. The cans above are going through the second process. Lucy said that it works better if you let it sit outside in direct sunlight, but I haven’t tried it that way yet. Having to go through the process about 5-6 times to get my cans this rusty. The rusty wire is for another project so don’t forget to come back later to see what it’s for. I added a patina to two keys and one washer to give my cans some color and used some twine to attach them onto the cans. I’ve been wanting a small succulent for a while now but everywhere I went they were out of the small succulents. When I finally found them I couldn’t make up my mine which one to buy so I bought all three. 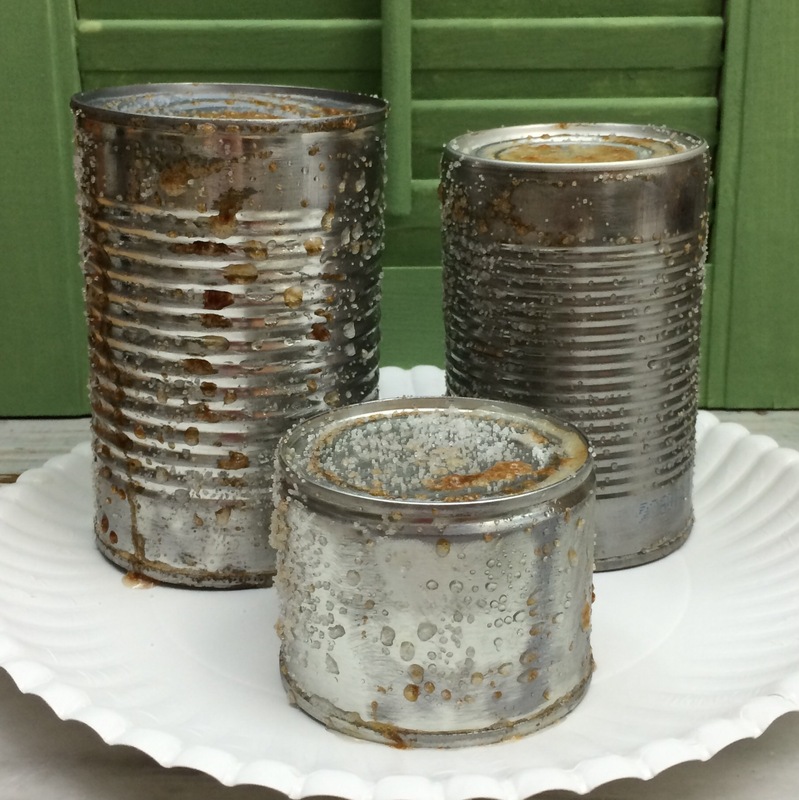 Don’t you think they look great in my new rusty cans? Those turned out really cute! It is funny the lengths we go to in order to make things look old sometimes. The results are worth the effort in this case! I know what you mean, but I was wanting real rust not faux (-; So I think it was worth it too. Thanks for stopping by and have a great day! Thank you Wendi, and Thanks for stopping by! Have a wonderful day! I love turning trash into treasures! Yep me too! Glad to finally be able to rust my own things, so expensive to buy cans already rusted. Hi Mickie! Yes it worked but took 4-5 times to get it like this. I’m happy how it turned out. Thanks for stopping by! This is such a great idea, Linda! Love this. Thanks you Erica! I think they turned out pretty neat for little planters. So cool. 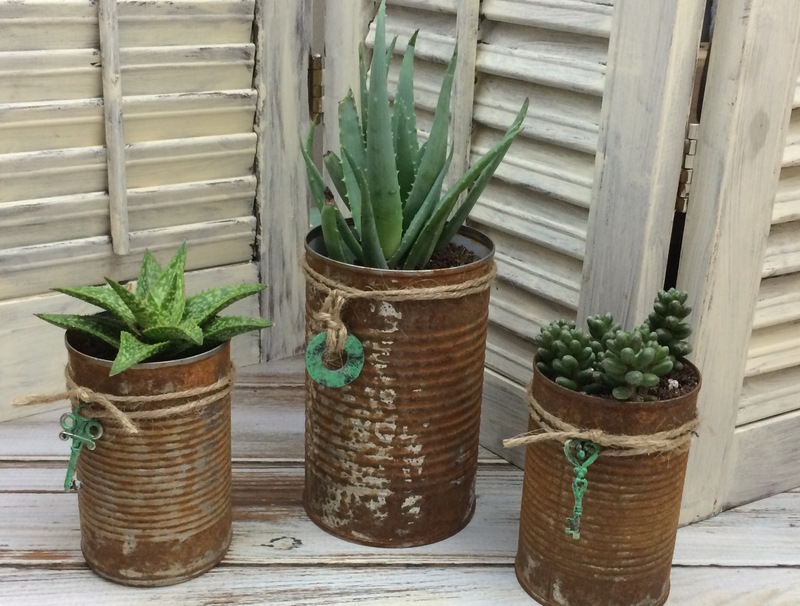 I love that rusty and rustic look. 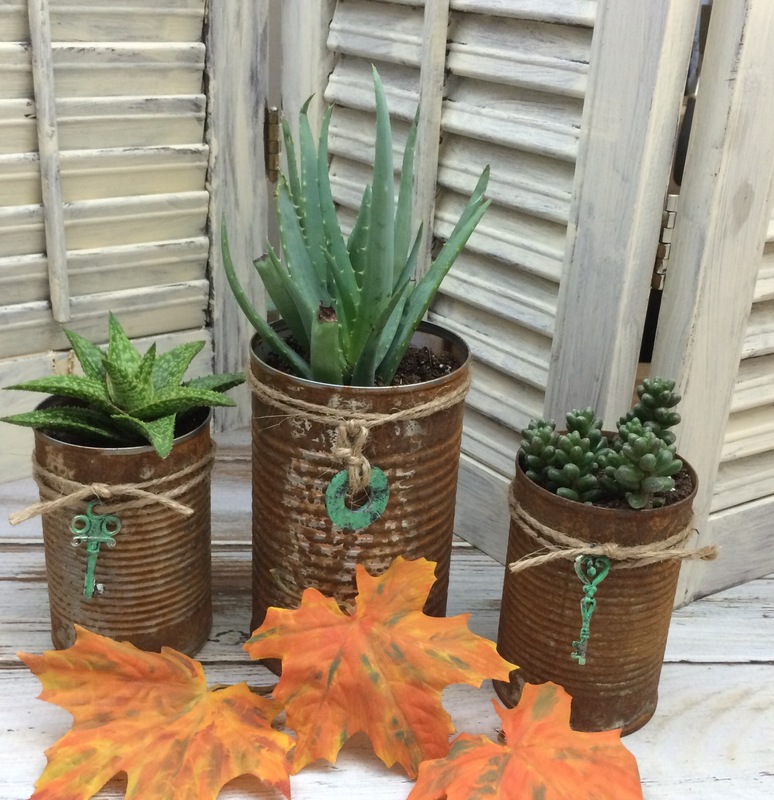 I love your rusty cans…beautiful touch with the turquoise embellishment!!! Thanks Michelle! I love how they turned out, and turquoise is my newest favorite color. I use it a lot. Hi, Linda! This is so cool!! I have a huge amount of tins, I am going to try it for sure! Thanks Pili! I need to make me some more, I really love how they came out. Thanks for the invite! Have a great day! Good Morning!! I wanted to stop by and let you know your post has been selected as a feature for the Welcome Home Wednesdays Link Party!! Stop by to see your post lined up and grab your Featured Button too!! Thank you Lisa for the feature! I just got back from linking up. Thanks! 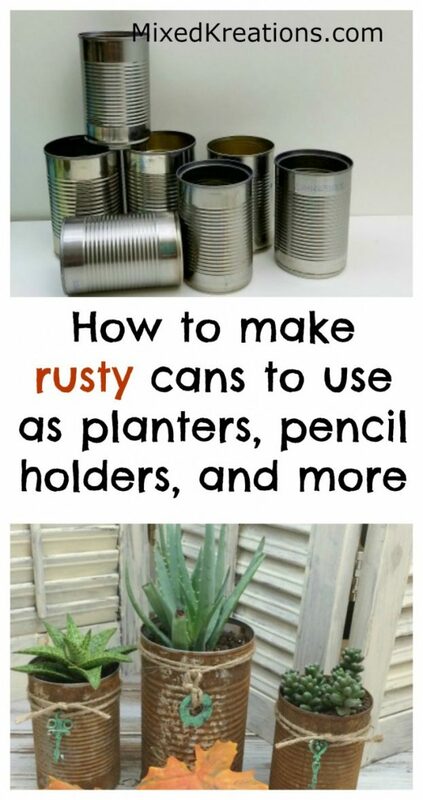 I LOVE all things rusty, and your can’s are perfection! Can’t wait to try this out! Thank you so much for the inspiration! Thanks CD Loken! I’m glad you enjoyed it. Let me know how it works for you. Super cute! 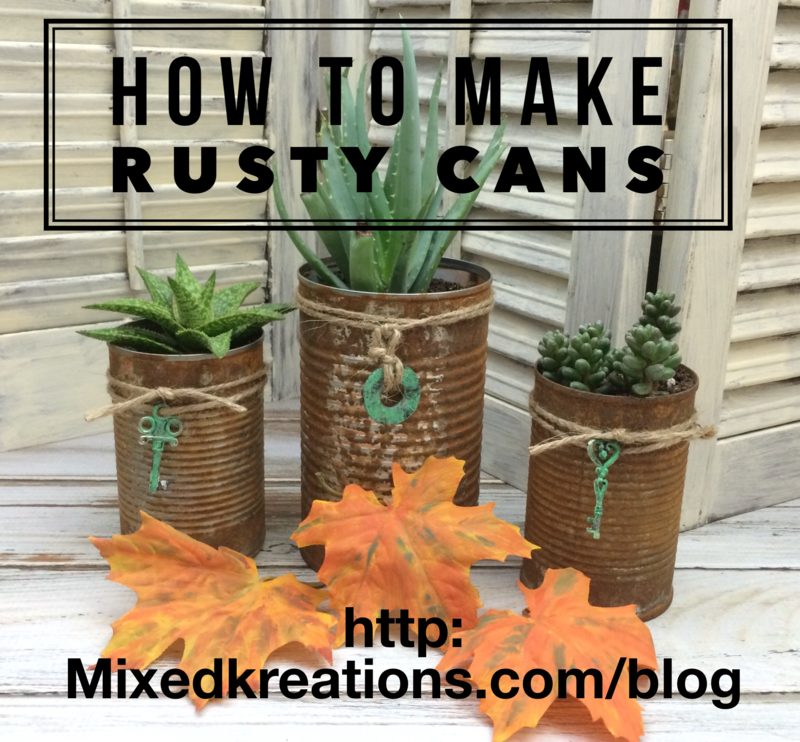 My best friend and I are going to make some rusty cans to be used as vases in her wedding! I just love how simple this recipe is and also how you chose to add those turquoise looking keys and washer! How did you add patina to them to get them to look like that?! Thanks for a great recipe! Thank you Noelle! I used a liquid patina that I bought at Hobby Lobby, in the jewelry department I believe. Question- how long between process should you wait before repeating to get the “more” rusty look like yours? 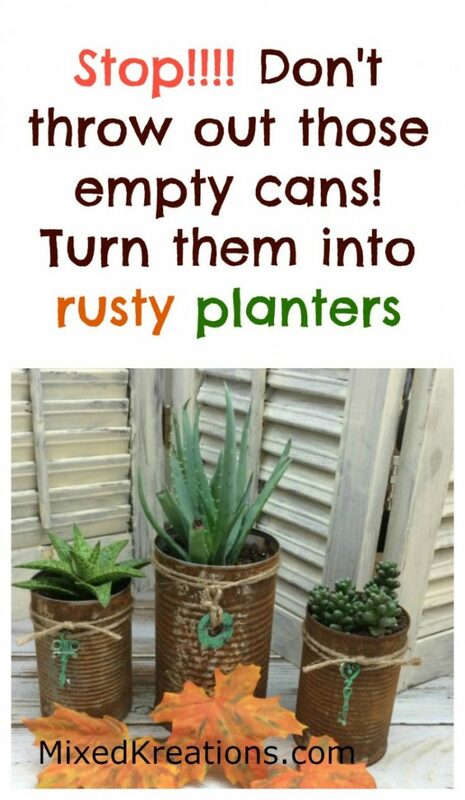 I love this idea and I hope it works for me and my $1 tin containers. Hi Karen! I probably waited about 30 minutes to 1 hour then sprayed them down and did the process again through out the day. Hope this helps! does it have to be a certain kind of can? I am on the second day of spraying the cans every hour or so and it’s no where near as rusty as these. Hi Maresa! I just used regular vegetable cans. That’s strange I have rusted quit a few using this technique. You are sprinkling the salt on after you spray with Hydrogen Peroxide? I went back and read my post, and I’m so sorry I forgot to mention to scratch up the surface of the can with coarse sandpaper. I’m sorry that’s probably why it’s not rusting easily. Please let me know if this helps! Now this is great to know. I have been saving some cans to do somethings with. I love the rusty look for sure. Love the look you gave yours. Nicely done. How long do you allow the peroxide and salt to sit on the can before you reapply it? Hi Brandi! I let it sit about 20-30 minutes till dry then I just spray more and add more salt. Hope this helps!